Many of you are trying to gain muscle mass and loose weight at home without having to pay for a gym membership. 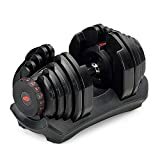 One of the best ways to accomplish this is to look at a pair of bowflex adjustable dumbbells that will let you get the best bang for the buck when buying any type of fitness equipment. .
You could buying a traditional Olympic Weight set or regular dumbbells, but you need to have the room for it and they will cost a lot more in the long run. This is why they are so convenient. They allow the user to combine a wide range of weights in one little package. When it comes to training equipment, there aren’t many names that are as recognizable as Bowflex. Bowflex is known for their innovative space saving equipment and the Bowflex adjustable dumbbell series falls straight in line with this philosophy. 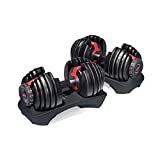 Let’s take a closer look at the Bowflex series of adjustable dumbbells which include the bowflex SelecTech 552 and 1090. You can read a more detailed review of the Bowflex SelectTech 1090 here. I’ll over everything so you can get a better picture if you are needing this set. The first thing you’ll notice about this set of dumbbells is how easy it is to change the weights. As a matter of fact, this may be the easiest and most intuitive system we’ve seen so far. All you have to do is adjust a dial on the side of the dumbbells to the desired weight. Then, all you have to do is lift the dumbbells and only the desired weight will be attached to it. The remaining weights will remain locked into the special tray they come equipped with. Another great feature about these dumbbells is that they still have a traditional look and feel to them. Many other types of adjustable dumbbells have weird design that can make them feel somewhat dangerous and cumbersome. With the SelectTech Bowflex series, you will feel right at home. The units are also very pleasing to the eye and will fit great in your home gym. One more great feature of this kit is that it allows you to put more weight on one side of the dumbbell than the other. This can be great depending on which movement you’re doing. These dumbbells are also very safe and are equipped with a system that keeps the dumbbell locked in the tray if the dial isn’t adjusted properly. Once again a great plus for the SelectTech series. The 552 model allows up to 52.5 lbs of weight while the 1090 allows up to 90 lbs, which should be enough for most bodybuilders. The 552 comes with a 2 year guarantee on all parts and the 1090 comes with a 3 year guarantee. Ranges from 5 to 52.5 weight selections. Any Concerns about Bowflex SelectTech 552 Weights? Well, one of the issues with the Bowflex SelectTech series is that the dumbbells can seem a bit long. This can be an issue when you do incline or flat dumbbell presses or shoulder presses. You might have to slightly modify your movements to get optimal results. Another problem with this set of weight is the grip. While Bowflex did a great job at creating a grip that is as steadfast and ergonomic as possible, the grip’s design, which is slightly larger in the middle, can feel very strange in the hands. I would rather have a regular uniform grip like most traditional models. However, you should get used to it after a while. When considering all of its aspects, the Bowflex SelectTech series of adjustable dumbbells is an outstanding product. They encompass everything that makes Bowflex such a great brand when it comes to fitness equipment. The dumbbells are sleek and stylish and adjusting the weights is a breeze. As a matter of fact, you’ll be hard pressed to find another unit on the market that allows you to switch weights so easily. Bowflex is one of the only companies that offers a results guarantee in addition to their regular warranty. That means that if you don’t have the desired results within 6 weeks, Bowflex will reimburse your money minus shipping with no questions asked. So if you’re looking for a versatile and stylish set of dumbbells to add to your gym, then the Bowflex SelectTech series is highly recommended.